I guess this means that Elsevier will sue me for the on-line review system I created for the SVPCA in 2001. Once in a while something happens which really tests the bounds of credibility. How can intelligent people do something so astonishingly stupid? They surely can’t *really* believe they invented cascading peer review? But more importantly, what can they possibly hope to gain by this? Are they really going to use it to take cascade journals to court? You’d think that when you are in a PR hole as deep as Elsevier that you’d at least *consider* cessation of further excavation. Rather worrying. I’ve posted about it on my blog and linked through to this; it deserves to be widely discussed. I read the patent. I’m not a patent lawyer, but it seems fairly obvious that they are not trying to patent cascading peer review (which they, and you, and all of us, know is not novel). 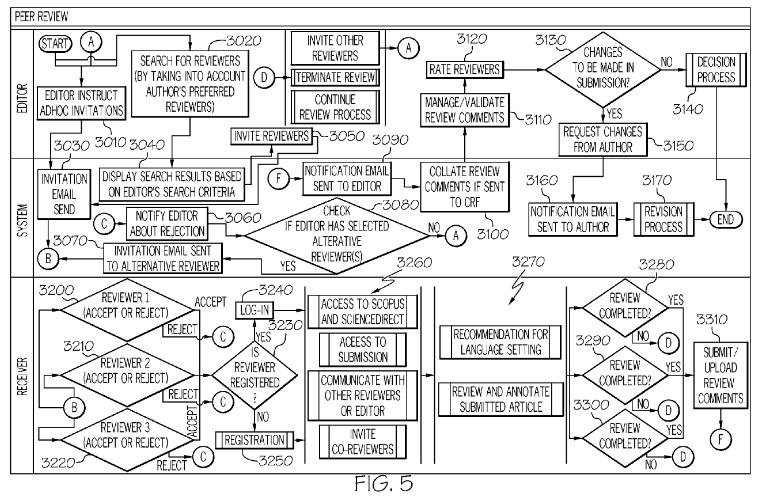 They are trying to patent a combined hardware/software system for administering cascading peer review. Whether their system is novel enough to merit patent protection is something that could be addressed by a legal challenge; but that’s a totally different issue from “they’re trying to patent cascading peer review”! At least, as I read the patent. I’m not a patent lawyer either, and I hope you’re right. But overly broad patents have a long and dishonourable history. Ultimately, a patent amounts to the right to sue someone for doing something vaguely similar to what your patent describes. After that, the rest is up to lawyers. Ultimately, holding a patent of this kind provides endless opportunities for a bad actor to impede the legitimate activities of their competitors. As to whether Elsevier becomes such a bad actor: we’ll just have to wait and see. This is surely a joke – they have been almost the definition of bad actor in scholarly publishing for so long, I don’t think we have to wait and see. Whether they are particularly bad on this particular issue will be revealed eventually, but I think it is a pretty safe bet. I don’t suppose there’s any hope of some class-action attempt to strike down the patent?